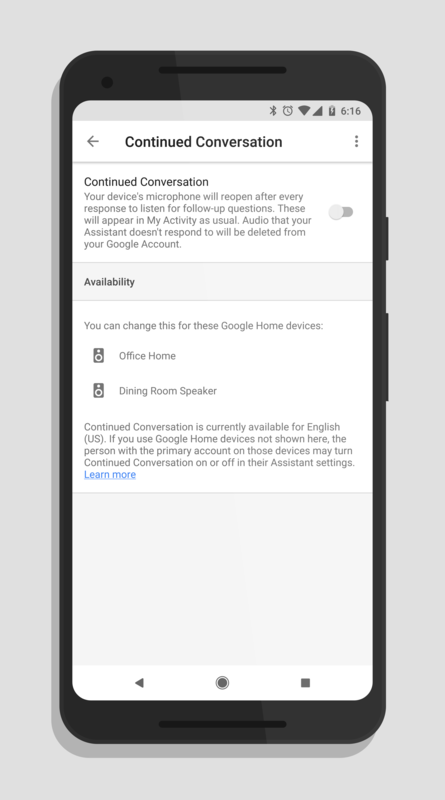 After trickling out over the course of the past few days, it looks like Google has pushed the big red button and the broad release of Continued Conversation for Google Assistant on Google Home is happening. The feature, which was highlighted at Google I/O, is aimed to create a more natural conversation between you and Assistant without having to issue a “Hey Google” for every command. Now you can say “Hey Google” once, issue a command (or a series of up to three commands) and Assistant through your Google Home will execute them. Then it listens for another few seconds for a follow up command. If you don’t issue a follow up command, or if you say “Stop” then it no longer listens and goes back into waiting for you to say “Hey Google”. Now instead of having to say “Hey Google” all the time, you can issue the command far less and get things done or get information. To setup the new feature is pretty easy. On your phone, go to Google Assistant or the Google Home app. Go to Settings (or More Settings in the Home app) and then tap on Preferences under the Account section. There you should see the Continued Conversation option which you can enable. If you don’t see it yet, don’t fret. It’ll be there soon. While you set this feature up on your phone, it doesn’t actually work there. It only works on your Google Home, at least for now.